The recent mutiny in Abidjan, the army revolt in Burkina Faso and the uprising in Kampala demonstrate that Africans have joined the Arabic uprisings to eliminate there in human dictators. In Uganda the Protest is led by the city which supported Musevenie to power- Mbale. The protest was triggered by food price and the repeted arrest of the opposition leader for the 4th time in a month Dr. Kiza Besigye. The same is expected any time in Ethiopia while the regime is trying to divert the attention towards Eritrea and by constructing a Death Dam of inhuman proportion to irrigate the grabbed land of the starving millions. 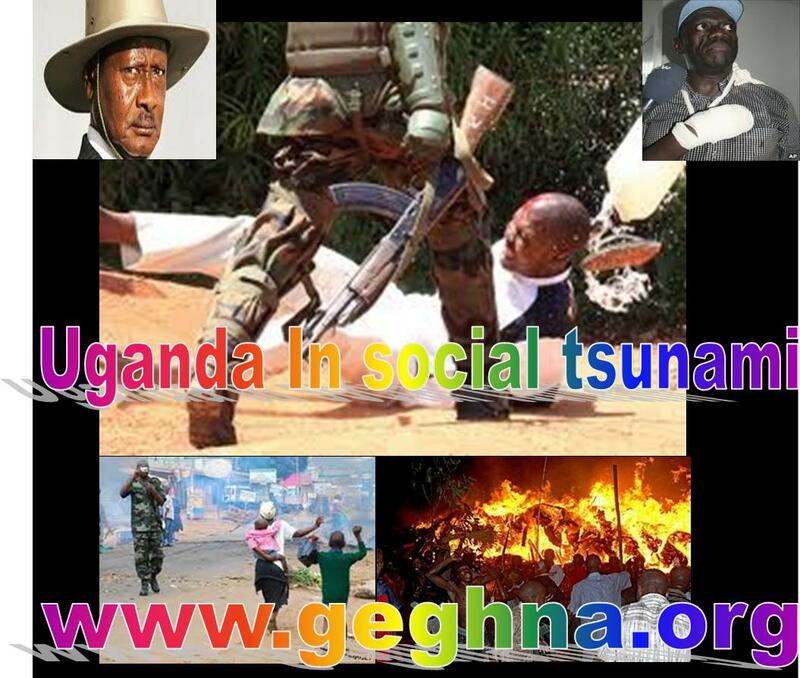 The man in power in Uganda since 1986, President Museveni’s ordered his army to shoot at everything that moves the streets of Kampala like his friend Gaddafi in Misrata. It was best demonstration his dictatorial behavior which is similar to that of Gaddafi and Idi Amin Dada when his soldiers wounded a child in the streets of his capital today. Uganda as a nation is start seeing the return of Idi Amin’s times when Museveni could not help the rising prices of basic commodities and fuel, and the loss of life and pain inflicted on them by his forces. Rather he bloody confirmed that the rising prices of food, is good news to farmers like Melese Zenawie of Ethiopia. Musevine in Kampala and Melese in Addis Ababa Knew well and good the high prices of food commodities are due to a number of factors beyond farmers’ control or could be controlled by artificially imposing prices like in Ethiopia. It seems the African dictators are far disconnected from the reality on the ground. First, prices are high due to low food production. It is simply when the supply is low, prices tend to be high and vice versa. Farmers are not going to reap money from rising prices just from the air. The Dictator of Kampala is responsible for the t negligence in the agricultural sector is to blame for the food scarcity and hence high prices and poor living conditions like his collage in Ethiopia Melese Zenawie. The later is megalomaniac is building dams while over 2 million Ethiopians are starving to death. The great lakes dictator dream that Uganda could become a food basket for Africa is far from reality. Like in Ethiopia the Ugandans are disappointed by the way the nation’s resources and money have been spent- purchase of the multi-million fighter jets. Again like Ethiopia Ugandans need today is ability to feed their children, send them to school and be able to meet basic health care services. President Museveni is aware that sophisticated weaponry does not necessarily ensure the survival of a government since he defeated the mighty army of Milton Obote having started his guerrilla group with only 27 guns and his friend Melees to defeat the great army of Mengistu Haile Mariam with few university drop outs. Nor the great Death dam in Ethiopia will save Melees Zenawi from the coming Social tsunami. What keeps the government in power and ensures the safety of its nationals is the WILL of the people. It was people’s will that brought President Museveni to power. Once people lose trust in the government, it cannot survive anymore. Gaddafi has got all sorts of arms but used it against his won people. Therefore, why should the nation waste all this money on weapons in Uganda and Dams in Ethiopia while people are starving in both countries? In Ethiopian and in Uganda the only enemy one can think of is the opposition; those individual who do not share the same political ideology with their respective current regimes. Not surprisingly, all the arms purchased will be used to kill nobody but Ugandans! And all the dam waters on the Nile will be used to irrigate the grabbed starving farms fields. The over 230 years old ruling Bahrain’s Sunni dynasty called Saudi Arabia and the United Arab Emirates to stop the social revolution. They dispatched forces to Bahrain on Monday to put down weeks of protests by the country’s Shi’ite Muslim majority. Opponents and Iran called the move a declaration of war; others called it pure annexation of the Island kingdom. On arrival the protestors way of welcoming the 100 strong Saudi soldiers by shooting one dead. The king reacted by declaring a three month emergency rule all over the island. Bahrain would be occupied for the coming unknown period by the Saudi soldiers in fear of the concessions by the country’s monarchy to the Shi’ite. The Saudi Sunnite Kings are in fear of the revolt from Bahrain to spreading to her Eastern Province, which is inhabited by Shift and the center of the Saudi oil industry. “They are part of the Gulf Cooperation Council (GCC) force that would guard the government installations,” referring to the six-member bloc that coordinates military and economic policy in the world’s top oil-exporting region. Bahrain said on Monday it had asked the Gulf troops for support in line with a GCC defense pact. The Gulf Cooperation Council comprises Bahrain, Oman, Qatar, Kuwait, Saudi Arabia and the United Arab Emirates. The UAE sent about 500 police officers into Bahrain, Emirati Foreign Minister Sheikh Abdullah bin Zayed al-Nahayan said. “The Bahraini government asked us yesterday to look at ways to help them to defuse the tension,” he said. “Other Gulf countries will also participate to get calm and order in Bahrain,” said Sheikh Abdullah, in Paris for a meeting of G8 foreign ministers. Bahrain has been gripped by its worst unrest since the 1990s after protesters took to the streets last month, inspired by uprisings that toppled the leaders of Egypt and Tunisia. Thousands are still camped out at the Pearl roundabout, having returned since the army cleared out the area last month. Any intervention by Gulf Arab troops in Bahrain is highly sensitive on the island, where the Shiite Muslim majority complains of discrimination by the Sunni Muslim royal family. 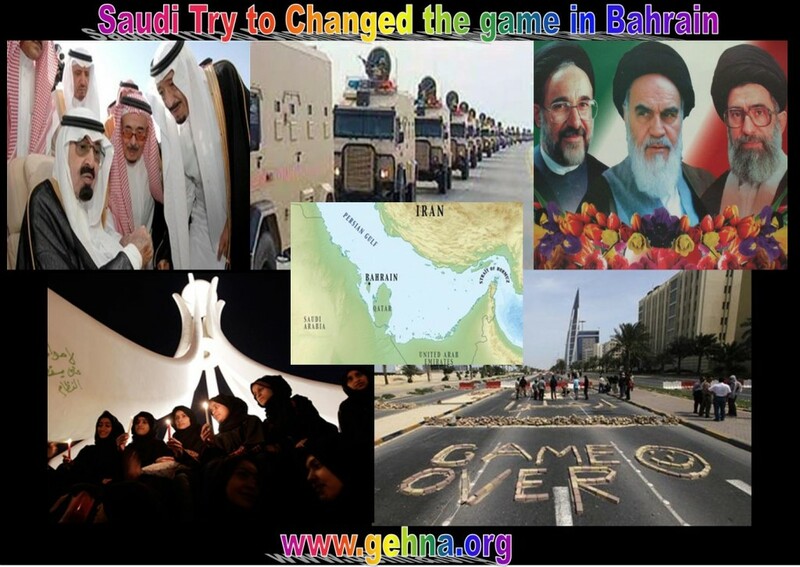 The whole world is waiting the move of Iran in reaction to the move of Saudis in the defense of the Minority Sunnite In Bahrain, the Island populated by majority Shi’ite in revolt?.